In an earlier blog on the truck driver shortage, we talked about how the challenge would be greatly alleviated if there were more women truck drivers. Despite women making up 51 percent of the population, their numbers currently stand at an estimate 5-6 percent of the truck-driving workforce. Why? 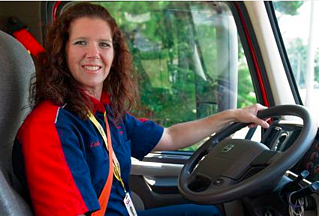 Several commercial and non-profit organizations are touting the benefits of a truck-driving career to women, including the Women in Trucking Association and the – perhaps inevitable – rivals Women in Trucking Foundation and REAL Women in Trucking. These groups have become advocates for change in the industry to attract more women. Truck manufacturers are catching on to the idea that it would make a difference if the equipment was actually designed with women’s physical dimensions in mind (there’s nothing sexist there – the height difference between men and women in the U.S. is about 6 inches on average). Ryder System Inc., which manages a fleet of 231,900 commercial vehicles worldwide, announced in February that it was the first trucking firm offering a custom vehicle design that includes 15 unique specifications that are intended to better meet the needs of female drivers. The company says it is currently encouraging OEMs to make adjustable foot pedal height a standard feature in future truck models; the most requested feature, according to a survey for the Women in Trucking Association. A new newsletter aimed at women truck drivers was launched earlier this year, called She Drives Trucks, going out to 50,000 of the estimated 200,000 female truckers in the U.S.
Why aren’t more women driving trucks? Another issue is the difficulty of arranging transportation networks so that drivers get home at the end of the day. With women still the traditional carers at home of children and the elderly, that consideration bites harder on this group. KANE’s network model is increasingly focused on getting drivers home every night, and we hope very much to attract more women drivers, as well as men, that way. One issue that definitely concerns women in particular is the facilities available on the road. Not only is it still relatively tough to find places where women truck drivers can shower in safety and privacy, truck stops continue to be places that many women find distasteful or even dangerous. Still, the operators of truck stops are making an effort to better cater to women. Tom Liutkus, TravelCenters of America’s vice president for marketing and public relations, said his company has been working with the Women in Trucking Association to improve its service to women truck drivers. Today, women are breaking through and thriving in many careers perceived as male-dominated. One’s making a bid for the White House. We’d love to see more women choose a career on the road, and with the right changes in equipment and conditions on the road, we think it can happen. Kane is Able is proud to promote women across our operations, including Kimberly Kavaliauskas, our Maintenance Manager, who received the 2013 Woman of the Year Award from the National Association of Professional Women (NAPW). And, in June this year, KANE’s sister company, Kalstar Enterprises, was recertified as a women-owned business by the Women’s Business Enterprise National Council (WBENC). We hope to see many more women on the road, enjoying the flexibility and good benefits the job can and should offer. We support and encourage women truck drivers.